bl.uk > Online Gallery Home	> Online exhibitions	> Asia, Pacific and Africa Collections	> Bindumadhava Ghat [Benares]. 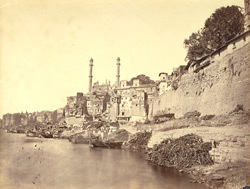 View looking along the river at the Panchaganga Ghat, with the smaller Aurangzeb Mosque in the background from Views of Benares, from the River Side taken by Brajo Gopal Bromochary in 1869. The Bindu Madhava temple on the Panchaganga Ghat was dedicated to Vishnu and was probably destroyed several times between the twelfth and sixteenth centuries and was rebuilt for the last time by Maharaja Man Singh of Amber in the late sixteenth century. According to travellers accounts it was impressive and large. The mosque was built by Aurangzeb (r.1658-1707), the ruler of the Mughal Empire. The mosque is on the site of the Bindu Madhav Vishnu temple, this is probably why the mosque is known locally as Madho Rai Ki Masjid. Parts from the temple were used in the construction of the mosque. The minarets (seen in this view), were restored by James Prinsep in the 19th century and further shortened before they were finally pulled down by the government due to their instability.